Composite decking offers a number of amazing benefits for your decking project. Aside from its unmatched durability, it comes in a wide range of colors and finishes, providing a low-maintenance, long-lasting luxurious deck to suit your lifestyle and budget. Unlike the other guys, we’re not here to talk you into the most expensive product we have. We combine our extensive knowledge with real-life experience and work directly with you to find the perfect composite decking material for your project. We’ll even draw up your deck design to help you envision the layout before making your selections. Tamko® offers a 20-year warranty. A larger variety of colors and styles to choose from. We carry several brands, at least 15 varieties in our Tamko® line alone. No termites or carpenter bees are getting into THIS stuff! 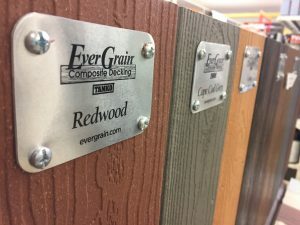 All composite decking is made the same. Today’s composite decking offers a huge range of look and pricing variations. 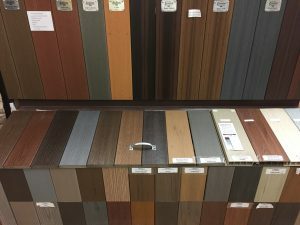 From the heavy graining and color variation of PVC decking to the more budget conscience basic composite, we offer a large selection for you to choose from. Composite decks are made entirely of composite materials. If you’re looking to build a composite deck, it’s important to note your composite deck still requires a real wood structure. You can however cover the deck foundation in composite materials for better protection. Provide us with your specific dimensions. We’ll guide you through the various composite decking options to help you select the right choice. You’ll receive an in-store estimate right there on the spot. We provide same-day delivery for composite decking products that are in stock at the time of your purchase. For special orders, delivery may take up to 48 hours. For the more basic decks, we can quickly draft something for you to give you a good starting point for choosing your materials. Contact us for pricing information on drafting bigger or more complex deck designs. How many composite decking board sizes are available? Most composite deck boards are offered in 12 feet, 16 feet and 20 feet in length. What’s the difference between PVC composite and basic composite decking? PVC (polyvinylchloride) composite decking is coated with PVC, rendering deeper color options than basic composite. 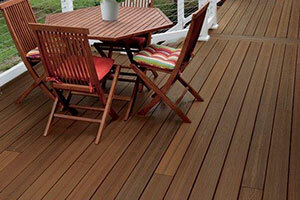 PVC decking is more resistant to color fading and, in brands like Tamko®, is more durable as well. The basic standard full composite has no PVC coating for extra protection, so it’s not quite as durable as PVC composite. It can also fade faster than the PVC decking. Do I need any special tools to build my composite deck? We carry the Camo Marksman Pro, which allows you to fasten your composite decking through the side of the board rather than through the top, helping you preserve the surface of your deck. It’s fairly inexpensive, simple, easy-to-use and features no electric motors. Yes, we offer a 6-month deferred-interest payment plan, which requires you to make the minimum payments on your balance each month. If you choose not to participate in our payment plan option, cost for materials must be paid in full prior to product delivery. Feel free to ask any one of our staff for more details about our payment plan.